It’s Wednesday, so that means its time for another “Where In The Universe” challenge to test your visual knowledge of the cosmos. This is number 40! Woo hoo! See if you can name where in the Universe this image is from, and give yourself extra points if you can name the spacecraft responsible for the image. Make your guess and post a comment. Check back sometime on Thursday to find the answer and see how you did. UPDATE: The answer has now been posted below. No peeking before you make your guess! This is Mercury, taken by MESSENGER in October 2008 as the spacecraft approached the planet during the mission’s second Mercury flyby. This image shows nightfall on Mercury. It was taken by the Narrow Angle Camera, showing an area about 420 kilometers (260 miles) wide. The spacecraft altitude was 15,900 kilometers (9,900 miles). For more information about this image check out the MESSENGER website. Thanks for taking part in this week’s WITU Challenge. Check back next week for more! Mercury. Why is your IT messed up? A cratered body with signs of tectonic activity? There are several. The crater density doesn’t seem to be big enough for this to be the Moon or Mercury. Is it Enceladus? Shot during one of the close-range Cassini flybys? Looks somewhat like Lacus Mortis, on the Moon, between NE Serenitatis and Hercules and Atlas craters. The low solar phase angle leaves me uncertain, however. no no, it’s an extreme close-up of Bill Murray. I’ll go with Mercury, as viewed by MESSENGER. There’s an odd regularity to the pattern of those craters that I don’t recall from the Moon. 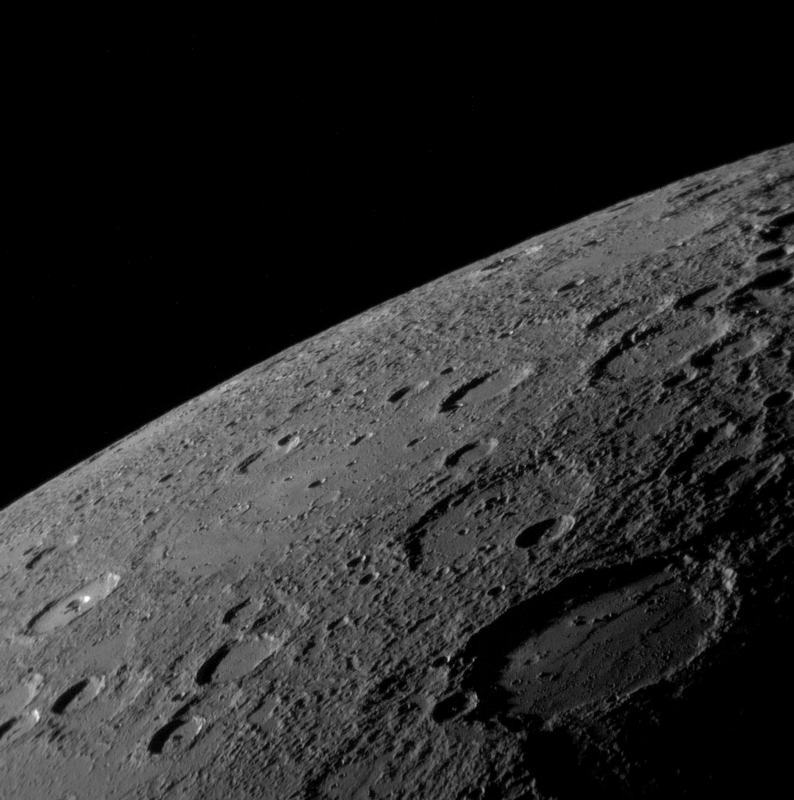 It’s Mercury’s lava plains shot by MESSENGER. This looks so much like mare basalt. So I’ll opt for the Moon, near side, maybe by Kaguya? Strike my first guess here: I had forgotten that the craters in Enceladus usually show rounded edges, not at all this crisp. This is rock, not ice. So it’s either Mercury or the Moon. Not sure at all, but since I have to choose one, I’m choosing Mercury (and Messenger). The Moon. Taken by Chandrayaan 1.
is it Saturn’s moon, Mimas? spacecraft, hey if I’m right I have to get my extra points! LOL Happy Galaxy gazing everyone! Moon, probably Tycho in the middle. The rays wouldn’t be prominent at this angle to the light. Probably from Chandraayan (sp?). It is the moon and I will guess the Selene mission. I cannot remember the Japanese name for it. I think Nancy’s trying to trick us into thinking it’s as simple as the Moon, so I’m guessing Mercury/MESSENGER. At first I thought Moon – Apollo, then Mercury – Messenger, but couldn’t it be Iapetus – Cassini? I have this picture on my desktop so I know it it of Mercury by MESSENGER. I think is Mercury, and the spacecraft is MESSENGER. My first guess was a picture from Mercury by Messenger. My first thought was Enceladus. But I’m new. Not the Moon – too much smoothness and not enough cratering. Same with Mercury in my opinion. It’s gotta be a moon of one of the outer planets. I’ll guess Ganymede. hmmm..mercury messenger. One thing that might give it is the broad terminator fringe indicative of a large solar disk on the celestial body´s surface. On the moon this would be a narrower region; here it looks broad. Craters with central peaks tend to be wide so this must be a large body. It’s a large impact basin imaged by MESSENGER with the Narrow Angle Camera (NAC) instrument on Mercury Flyby 2. Knew it was Mercury from MESSENGER straight away. It was the creater debris that gave it away. Previous PostPrevious What Are The Different Types of Stars?